We fumbled and stumbled through the first year, mainly on the headwaters of the Grand River, from Fergus to Inverhaugh. 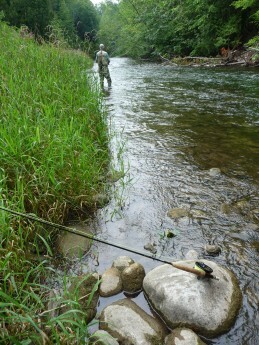 We quickly realized that fly fishing is a state of mind, with quick release from everyday worries. On one of the first trips we were amazed to see thousands of swallows flitting just above the waters feeding on hatching insects. Each year the Grand is stocked with brown trout at various locations, and the river is easily accessible from well marked pathways. That first year we caught mainly “stocker” brown trout. We started to appreciate the ever changing moods of the river; from tranquil flows to raging and unsafe torrents following rainstorms. The following year we broadened our outings to include the Forks of the Credit River. A great big shout-out to the Grand River Conservation Authority (G.R.A.C. ), The Friends of the Grand, Izaac Walton Fly Fishing Club, Credit Valley Conservation, Credit River Anglers Association, ,and Trout Unlimited, and the Ontario Ministry of Natural Resources.